Novo Nordisk A/S is recalling Fiasp® FlexTouch® batch number HP50949 in the UK. Fiasp® FlexTouch® is insulin used for treatment of people with diabetes. The recall is initiated as some Fiasp® FlexTouch® from batch number HP50949 might contain particles. To protect patient safety Novo Nordisk is recalling all products in the affected batch from wholesalers and pharmacies in the UK. 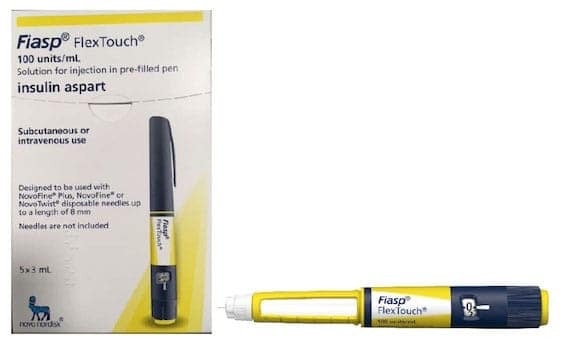 Novo Nordisk A/S is recalling one batch of Fiasp® FlexTouch® in the UK. The batch number is printed on the Fiasp® FlexTouch® box and on the label of the Fiasp® FlexTouch® pen as indicated below in the red boxes (Figure 2). In the event that the patient has experienced symptoms of too high blood sugar or injection site reactions they should contact their doctor for advice. The doctor or the customer should report any adverse events or complaints to the UK Novo Nordisk’s customer service, which can be reached at 0845 6005055 or via email at customercare@novonordisk.com. If you have any questions or concerns, please contact the UK Novo Nordisk Customer Service at 0845 600 5055 orcustomercare@novonordisk.com. The safety of the patients is the utmost importance for Novo Nordisk. We strive to produce and distribute the highest quality products for your use. We sincerely apologise for this unfortunate situation and the concerns and inconvenience it may cause.